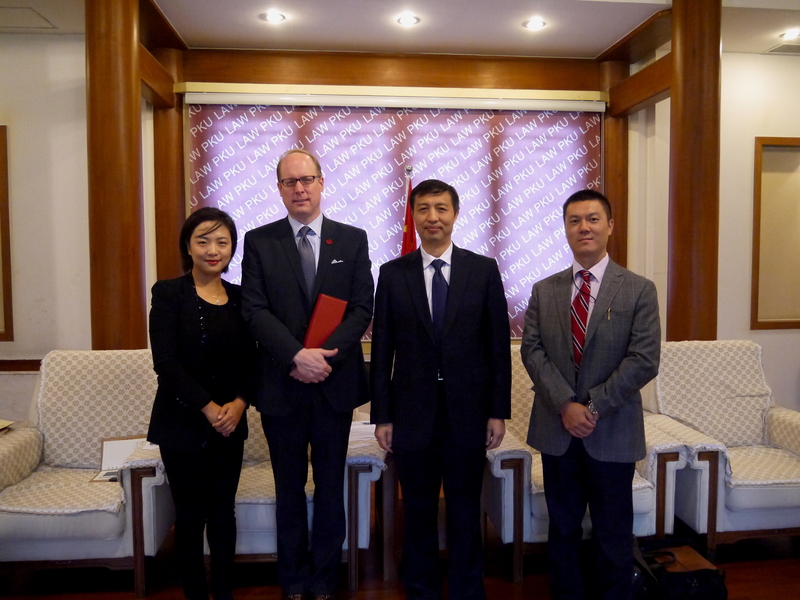 The Dean of Indiana University Maurer School of Law (“IUMSL”) Austen Parrish and Director of Indiana Gateway Center Steven Yu visited the Peking University Law School (“PKULS”) in the morning on October 21, 2015. PKULS Dean Zhang Shouwen and Assistant Dean and Director of External Affairs Office Dr Li Yuanyuan attended the meeting. Dean Zhang welcomed to the ISMSL delegation and thanked them for visiting the School. He hoped that today’s (October 21, 2015) visit is the first step of building the two schools’ relationship and looked forward to closer partnership in the future. Dean Parrish said that this is the first time he represented IUMSL to visit PKULS, and he briefed the PKULS representatives on the recent research in tax law and cyber security law at IUMSL. The two schools discussed the possibility and feasibility of establishing exchange programs between each other, to be commenced next year if implemented.